AV Sridhar (AVS) is the Co-Founder, President & CEO of Digité Inc based out of Cupertino, California. Digité Inc focuses on Lean Software Application Life Cycle Management. It has development centers in Mumbai and Bangalore. Earlier to Digité Inc he co-founded Neta Inc in 1998 which targeted the Web Data Mining and Personalization space. He successfully sold Neta Inc. to Disney Corporation in the Year 2000. 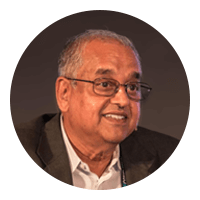 Prior to becoming an entrepreneur he was part of the early founding team at Wipro where he worked for 17 years between 1981 and 1997 in various capacities – significant among them being the CAD/ CAM Division partnering Sun Microsystems. As President he handled different portfolios during his long innings. AVS started various new divisions within Wipro like the eCommerce, Communications Division, Software Products Division, System Integration Division, the Technical System Division. AVS is currently Chairman of Advance Health Care, a network of diagnostics centers for Oncology, Neurology and Cardiology based in 6 different cities in India. He is also on the Board of WeP India. He graduated with a Bachelors in Engineering from Jabalpur Engineering College. He has completed various senior management courses at IIM Ahmedabad and GE Institute at Crotonville, New York. AVS has been involved with organizations like the Computer Society of India, MAIT while in India and is a TiE Silicon Valley Charter member.